The Blackmagic Design Smart Videohub CleanSwitch is a 6G-SDI router with built in re-synchronizers on all inputs and a tiny footprint. This enables clean switching between all video sources of the same video standard and can also allow for use as 12 re-synchronizers for automatic re-timing of SDI feeds. Smart Videohub CleanSwitch delivers 12 inputs and 12 outputs in essentially all SD, HD and Ultra HD video formats. Simultaneous multiple formats on the same router are also supported, enabling clean switch between different formats that match the reference frame rate when the switching is between the same video standard. A front panel button and spin knob routing are also included, as is an elegant machined metal front panel with LCD for routing display and video monitoring. 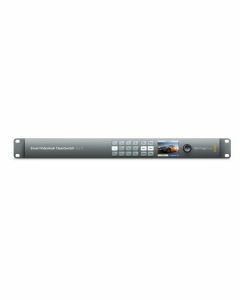 The Blackmagic Design Smart Videohub CleanSwitch 12x12 is a specialist model of Videohub that features resynchronization on all inputs, providing perfect clean feeds every time. To cleanly switch between video sources and monitors or directly to air, timed or genlocked signals are required. Smart Videohub CleanSwitch 12x12 has all of the same great features of the Smart Videohub 12x12, as well as including full resynchronization on every input so the router automatically re-times all inputs to ensure clean, glitch free switching between router cross points. Sources of different resolutions and the same frame rate can even be output directly to air for smooth, cuts only production. Just like all Smart Videohub models, you can control Smart Videohub CleanSwitch directly from the front panel or remotely over ethernet using the Videohub Control Panel software on a Mac or PC. SDI Video Input: 12 x 10-bit SD-SDI, HD-SDI and 6G-SDI. SDI Video Output: 12 x 10-bit SD-SDI, HD-SDI and 6G-SDI. Reference Input: Black burst and Tri-Sync for SD, HD and 4K. Front Panel Router Control: 12 buttons for local control of Videohub. 6 buttons and scroll wheel for control of LCD display or RJ45 Ethernet. SDI Compliance: SMPTE 259M, SMPTE 292M, SMPTE 296M, SMPTE 310M, SMPTE 425M Level B, SMPTE 425M Level A, ITU-R BT.656 and ITU-R BT.601. Display: Built-in LCD for video and menu settings. Physical Installation: 1 rack unit size. Less than 6 inches deep.